An aluminum pan sign, also referred to as a shoebox sign, is a sign fabricated out of flat aluminum with 90-degree returns on all four sides, typically 1”- 2” deep. It can be adapted to any wall surface with no visible fasteners. Because of its rigid construction and painted finish, these signs are very durable. The aluminum is weather-resistant, so it can hold up in all types of weather. Aluminum pan signs are very customizable. The box shaped style is the most common, however, a pan sign can also be made with rounded corners, in oval or circular shapes, or even in custom designs depending on your location and brand requirements. Decoration of the face of the sign can be achieved through applied vinyl or digitally printed graphics, which provide almost limitless design potential. 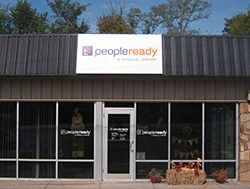 PeopleReady, a TrueBlue company and leading provider of specialized workforce solutions, used a 96” wide by 36” high pan sign to promote this Kentucky location. This non-illuminated sign is painted white and has pantone specific colors on the vinyl overlay. Read more about our work with PeopleReady here. 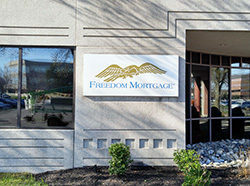 Freedom Mortgage, a privately held, full-service lender, chose a 2” deep non-illuminated aluminum pan sign for one of their New Jersey locations. This sign features a digitally printed vinyl overlay to match the pantone colors specific to their logo. 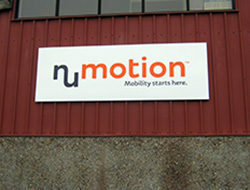 Numotion, a provider of Complex Rehab Technology, chose a pan sign for its location in Oregon. The sign is a 1” deep fabricated aluminum pan backer painted white. A vinyl graphic was applied over top of the paint to match the client’s specific pantone colors of their logo. 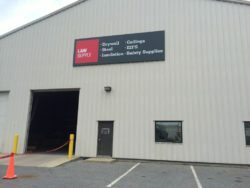 L&W Supply, a leading distributor of construction supplies and building materials used a 2” deep fabricated aluminum pan backer painted with pantone colors and applied vinyl graphics. They chose to not only include their company name, but to also highlight some of the core products they supply to their customers. Aluminum pan signs are a great-looking, affordable way to promote your business. Check out more of our samples just like these, by visiting our Egan Sign gallery. Do you think an Aluminum Pan Sign is the best fit for your company and have questions about them? Contact us today!